"Utah, Birth Certificates, 1903–1911", digital image, Ancestry.com, "Sackett, Alma Vernon, b. Randlett, Uintah County, Utah, 12 Dec 1906, father Edward S Sackett age 45 farmer of Randlett b. Minnesota, mother Mildred Powell age 39 8th child housewife of Randlett b. Spanish Fork Utah." US Social Security Administration, "Social Security Death Index", database, American Ancestors, "Alma Sackett, b. Dec 12, 1906, d. Dec, 1985, SSN 529-12-1123 issued UT, residence Layton, Utah, 84041, county Davis." "Bernalillo County, New Mexico, Marriage Index, 1888–2017", database, Ancestry.com, "27 Jan 1930, Albuquerque, Bernalillo County, NM, Alma V Sackett, and Ouyeda Wasson b. Albuquerque." Ouyeda's parents' names from 1920 census. 1920 and 1930 censuses have b. Arkansas. Ancestry transcript of marriage record stating b. Albuquerque is probably in error. "Utah, County Marriages, 1887–1937", database, Ancestry.com, "23 Jul 1935, Wasatch, Utah, Alma Vernon Sackett, 28, and Rachel Hansen, 17." Sackett, Clifford P, son, 1 1/12, b. UT, father b. MN, mother b. UT. 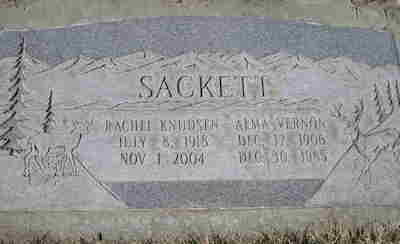 Sackett, Joseph Edward, son, 25, single, b. UT, father b. MN, mother b. UT, fireman, D&RERR, worker. Sackett, Clifford, brother, 21, single, b. UT, father b. MN, mother b. UT, laborer, odd jobs. "U.S. WWII Draft Cards Young Men, 1940–1947", database, Ancestry.com, "Alma Vernon Sackett, Morgan, Morgan County, Utah, age 34, b. Randlett, Utah, 12 Dec 1906, emp. US Govt Soil Conservation Service, wt 155, complexion light brown, eyes gray, hair brown, ht 5' 11", nok Martha [sic] Knudsen. Reg 1940."